I’ve just added a new event for August 19: Borderlands Books in San Francisco will be hosting a multi-author panel with me, Veronica Wolff, and up to two more authors yet to be announced. We’ll have swag and a limited number of special goodie bags stuffed full of books and cool things will be given away, so if you’re in the SF area, put it on your calendar! Details are on the Events page! Comments Off on New Author Event! 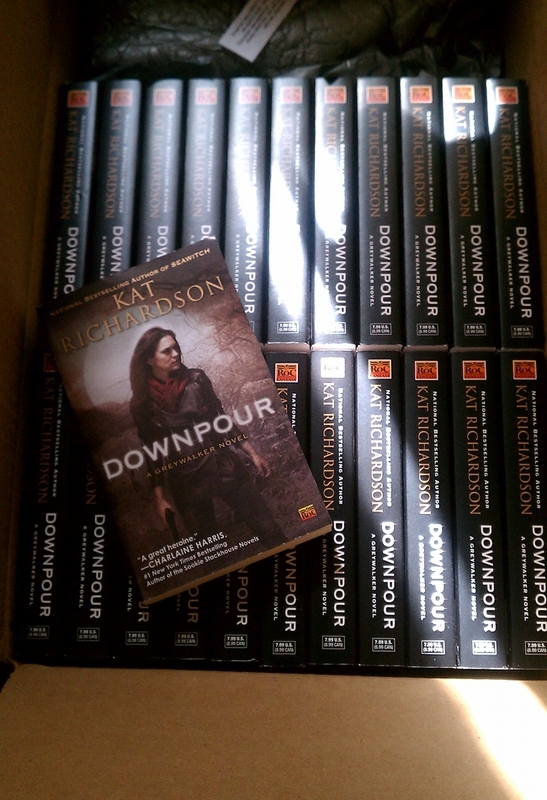 A boxful of Downpour paperbacks! Author’s copies of the paperback edition of Downpour. Whatever shall I do with them all…? Comments Off on Look What I Got Today! A fellow in Poland made this by hand–right down to cutting and shaping the gears by hand. Yes, that’s a standard wine glass, not a giant one. Thanks to my husband for the original link from Make magazine. Sometimes I just I love research! Mr. Kat worked at home yesterday and turned out to be very helpful. (This is not always the case with sigother working at home situations.) I’ve been trying to figure out why the clockwork story is having so many problems and I finally realized it had no driving conflict. So I had a nice chat with the hubster and we came up with a rather nifty conflict and plot driver that should make the story start running much better. My friend Ken George has been talking to me about a “poster” site for the Greywalker series, so we’ve split the site into two parts: KatRichardson.com (this site here) and Greywalker.com (the new poster site). Eventually we hope to put up a trailer at the new site, but both sites should remain running with referrals from G to KR for most info. Let me know what you think by dropping me a line. 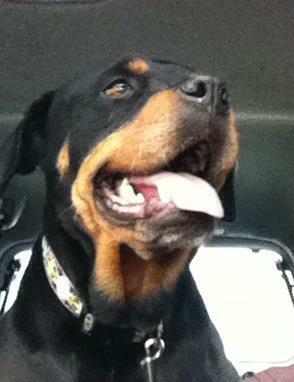 Tally needed emergency surgery for bloat and lost her spleen. Marti McKenna and others are raising funds to help Michaela pay the bill. And I’ve put up the only ARC of SEAWITCH that I have left (I only got 4.) It’s signed and if you want to get the ARC and or help out a foster puppy-parent, go and bid on the ARC–or any of the nifty stuff that’s up at this auction on FaceBook. Off you go now! Auction closes Sunday, June 3, at 6 pm Pacific.